In 2011, almost all people aged 65–84 years were living in private homes, whereas over a quarter of those aged 85 years and over were living in other types of dwellings, such as nursing homes. The place we call home as we get older plays a leading role in productive ageing. In 2011, 99% of people aged 65–74 years and 94% of people aged 75–84 years lived in a private dwelling. Almost four in five (78%) older Australians lived in a separate house, with seven in ten of those aged 85 years and over still living in a separate house. Five per cent lived in retirement villages. In 2011, one in five people aged 65–74 years were living on their own, compared with 35% of those aged 85 years and over. Two-thirds of people aged 65–74 years lived with a partner or spouse, compared with less than a quarter of those aged 85 years and over. 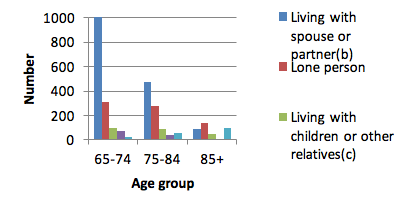 One in five people aged 65–74 years were living on their own, compared with 35% of those aged 85 years and over (see Figure 4). with child and child's partner only (less than 1%). According to ABS Household and Family Projections for 2011–36, the number of households in Australia is projected to grow from 8.4 million to around 12.7 million. Lone-person households are projected to have the fastest increase, going from 2.1 million in 2011 to around 3.4 million (27% of all households) in 2031. There are only small changes in the projections for persons aged 60–75 years, as figures have been stable over the past 20 years. In 2036, close to 60% will be living as a couple without children, and between 16% and 19% of 60–64 year olds and 17% to 22% of 70–74 year olds will be living alone. In 2012, over half of older people with disability living in a private dwelling needed some form of assistance with one or more activities of daily life. 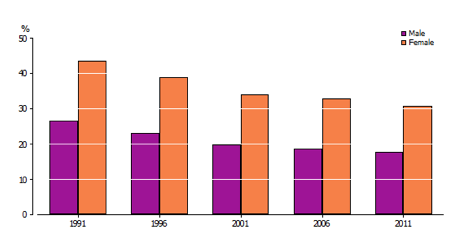 In 2012, ABS conducted its Survey of Disability, Ageing and Carers. This found that 53% of older people were classed as having a disability, with most of these individuals living in a private dwelling (85%). Of these, 56% needed some form of assistance with one or more activities of daily life. 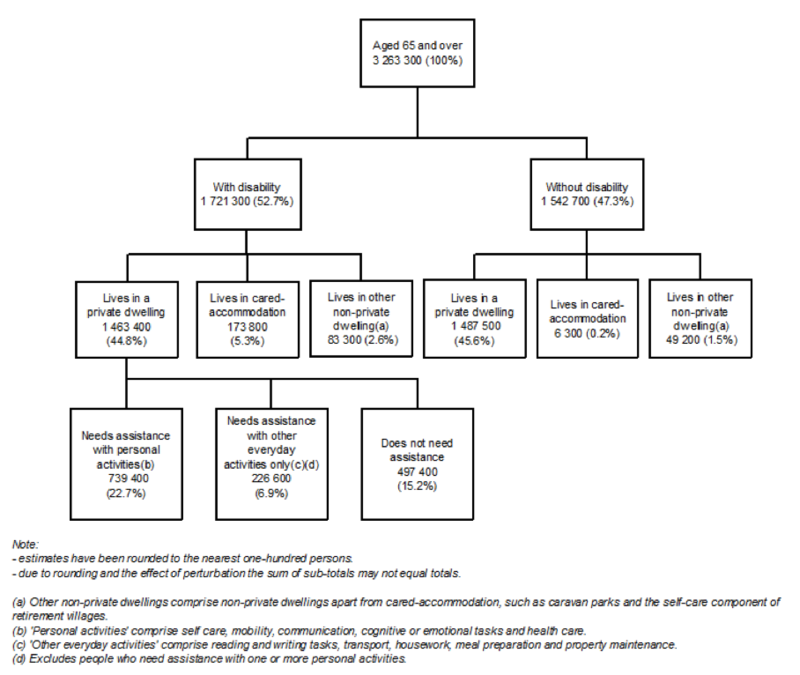 While most older people with disability lived with others, there were around 61,300 older people (2%) with a profound core activity limitation living alone in a private dwelling. For those people without a disability, almost all lived in a private dwelling (96%).